Spray a 9 x 13 casserole (or 2 quart size) with cooking spray. Add tomatoes and sauté until softened, about three more minutes. 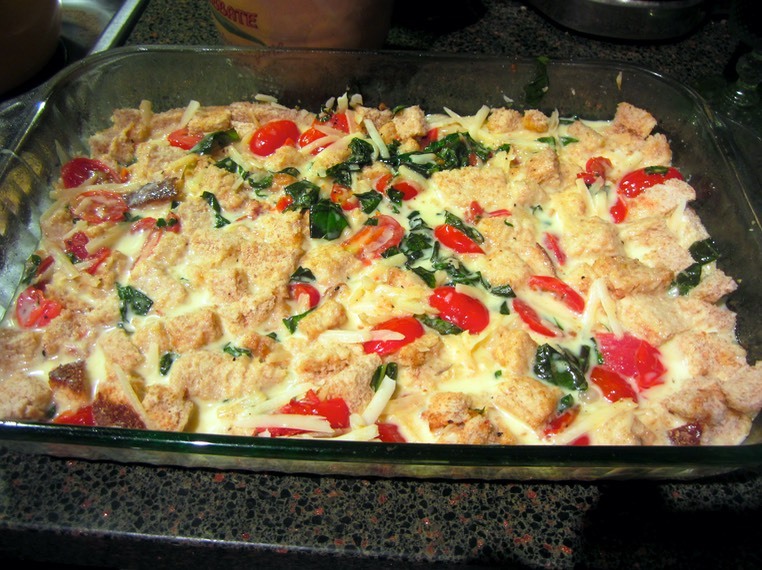 Put bread cubes in prepared casserole, top with tomato mixture and cheese, stirring to combine. In a large mixing bowl combine eggs and milk beating thoroughly. Stir in salt, pepper and hot sauce (optional). Pour egg mixture over tomatoes and bread making sure all bread cubes are coated with some of the egg mixture. Bake 25 minutes. Allow to cool slightly before serving.